In marriages, festivals and in the daily life of the adivasis of Mayurbhanj, Odisha, handia takes the centre stage, both as food and drink. In the adivasi heartland of eastern India women selling handia in weekly haats by roadsides is a very common sight. Rice is fermented with the aid a yeast comprising a few plants, known as bakhar, to produce handia and rasi. Handia is the thicker gruel and rasi is the liquid top layer. Formerly, bakhar or ranu was prepared with more than 20 plants but the depletion of many species it is now limited to less than 10. These are roots of samarkani, ankanadi, chaulia,kanga alu, patal garuda, habin jhad and bark of sal bisal, kuluchi with the whole plant of kalibahu. Equal quantities of these ingredients are ground together and sun-dried for an hour; the mixture is then dried in shade for few days, after which small tablets are prepared. The first step in making handia is to cook rice in water in 1:2 ratio; the cooked rice is then sun-dried, then stored in an earthen pot. Then 2-3 bakhar tablets are added to per kilogram of rice in the pot, the pot closed and left in semi-darkness. In a few days, depending on the weather, the content of the pot ferments, making a hissing sound, then settles down, signaling that the process is over. The liquid layer, the rasi is separated and consumed directly or diluted, depending on the preference. The semi-solid handia is filtered using a bamboo or metal filter and served, again adding water if required. Handia is best accompanied by a chutney of tamarind, chilli and salt. Bakhar is reputed to have several medicinal properties, especially against malaria, against liver ailments, blood pressure and dysentery. Both handia and rasi are health drinks and the adivasi people believe that it keeps them cool and protects them from jaundice. Incidentally, the production and consumption of handia creates employment for many and is quite remunerative and supports many adivasi families. A nagging worry is the unsustainable collection of the plant ingredients that go into making bakhar. No such conscious effort has been made for the propagation or conservation of these important plants. In the regions without forests the adivasi people now consume handia that has been prepared by using adulterated bakhar; in some places the plants used for bakhar are smuggled out. With the increasing amount of adivasis moving to cities the knowledge about bakhar and handia is further threatened. It is time that these serious threats, to a cultural and health drink of the adivasi, are given immediate attention. Great story! The narrative of the food culture of India has for long been dominated by upper caste persuasion. It is time that the subaltern and invisibilised food cultures are given their place in the sun. Would like to read more such stories that not only record these recipes but also probe the sociological, political and cultural provocations that shape the food cultures of various communities and the changes they are having to make to their palette for reasons that need to be spelt out. The write up is informative and well written. But it should have been more balanced and should have pointed out the downside of overconsumption of handiya that is rampant. People are inebriated from dawn to night, negatively affecting their and their family's condition. Informative article. 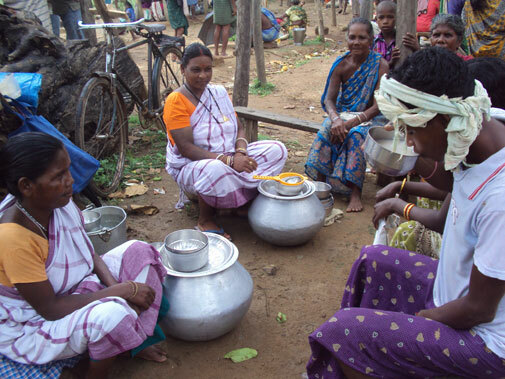 Santhals in Jharkhand, southern West Bengal and northern Odisha are inseparable from Handia as a traditional homely drink. It is a sight to see women, men and husband - wife pairs returning home from weekly hats inebriated. Mahua liquor though available, Handia has maintained it's distinctiveness. The herbs used is not well documented and needs study.